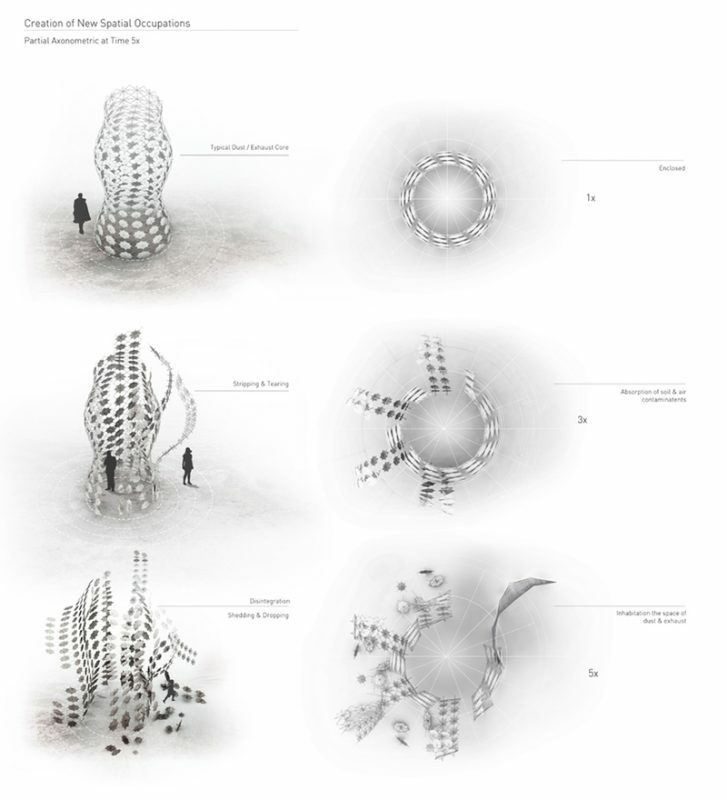 Particulate Forest is discursive exploration into the engagement of spatial configurations with ambient or imperceptible conditions of the atmosphere. 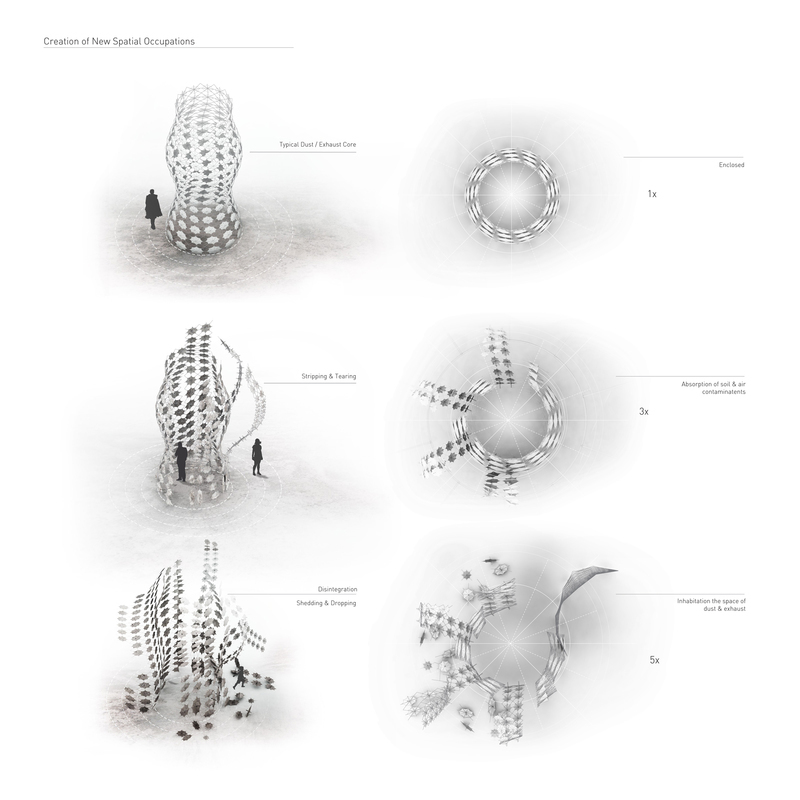 Through the attraction of dust, exhaust, pollen and other waterborne particulates, the forest acts as a translational device to its milieu; directly observing the environmental composition it is situated within. 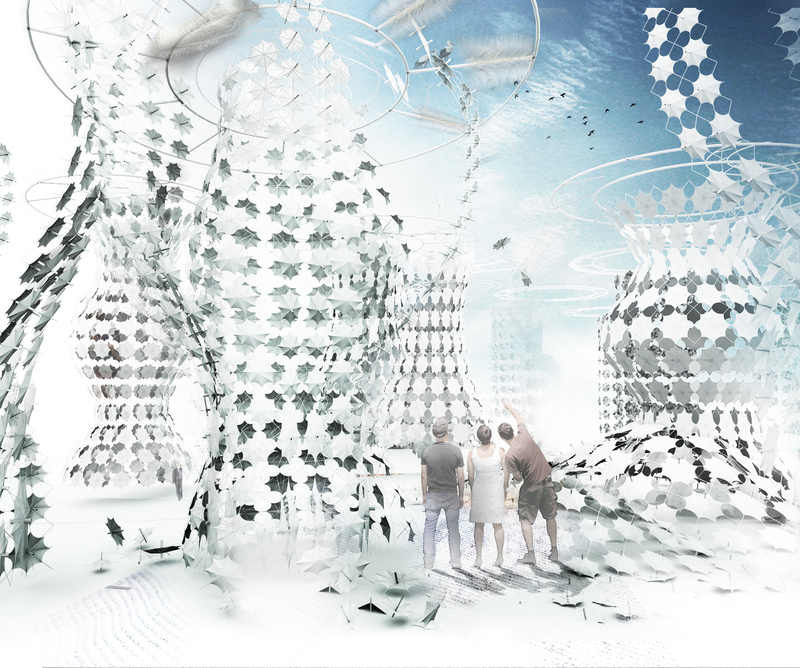 The forest is composed of various types of material modules that possess specific means of collecting particulates including the use of electrostatic charge, humidity sensitive fabric, photovoltaics and phase change mediums. 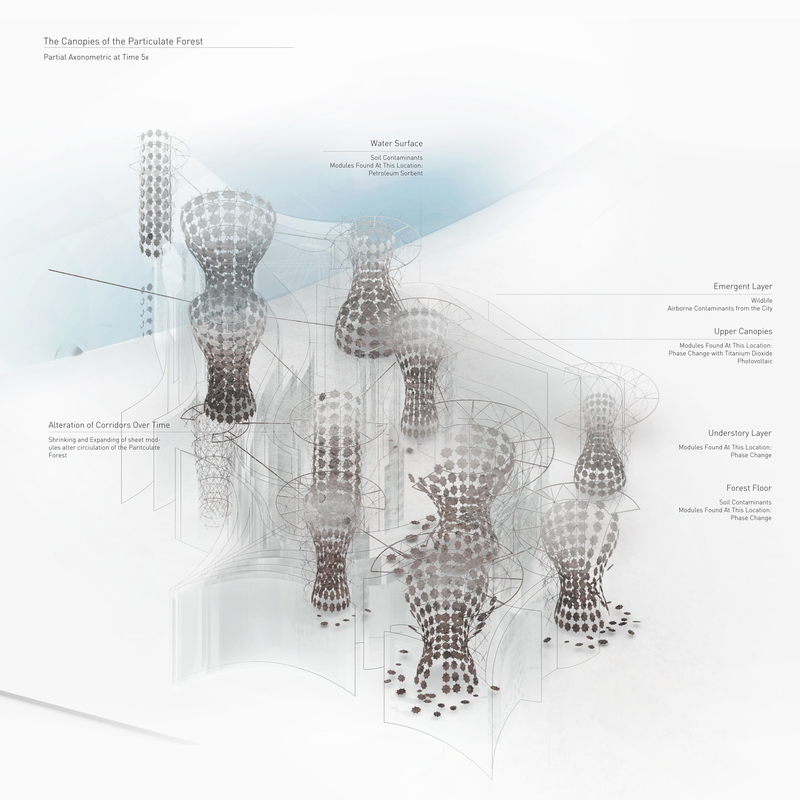 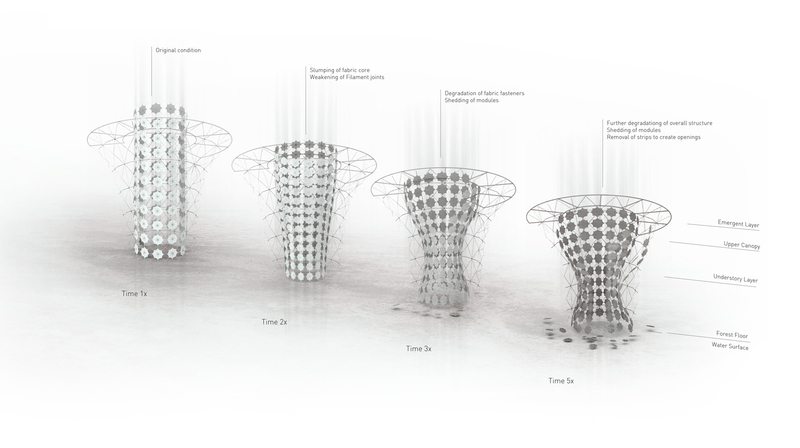 The placement of each fabric module is situated within either the surface screen or a revolved core, materiality is dependent on its altitude as well as location within the overall assembly. 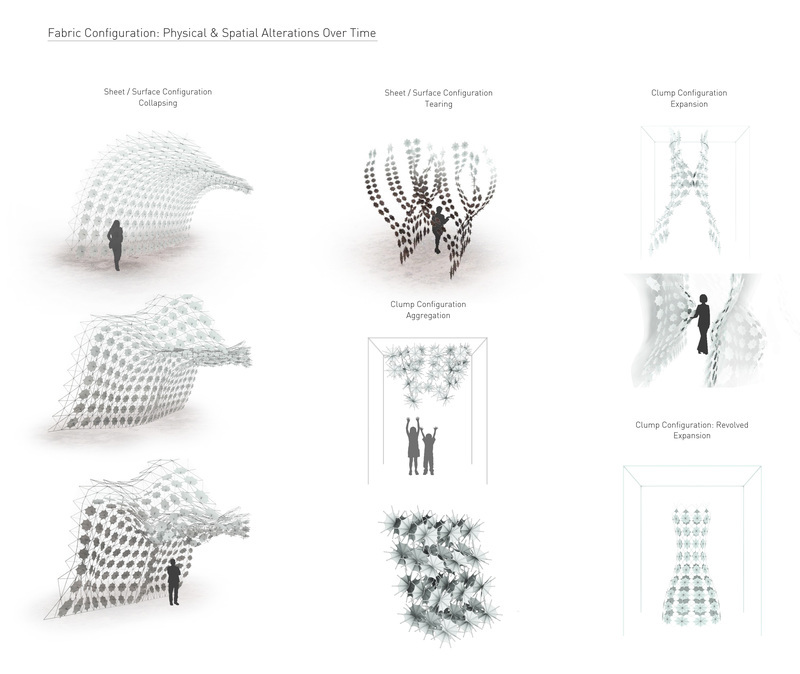 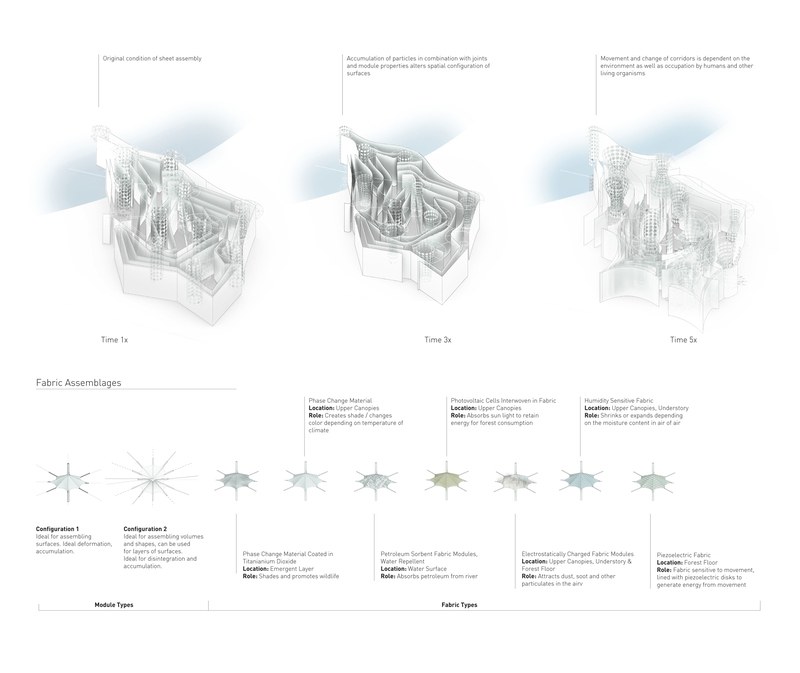 Over time, the joints between modules disintegrate under the weight of accumulated particulates and allow for the interaction between adjacent modules to transmute and alter the spatial experience within the forest. 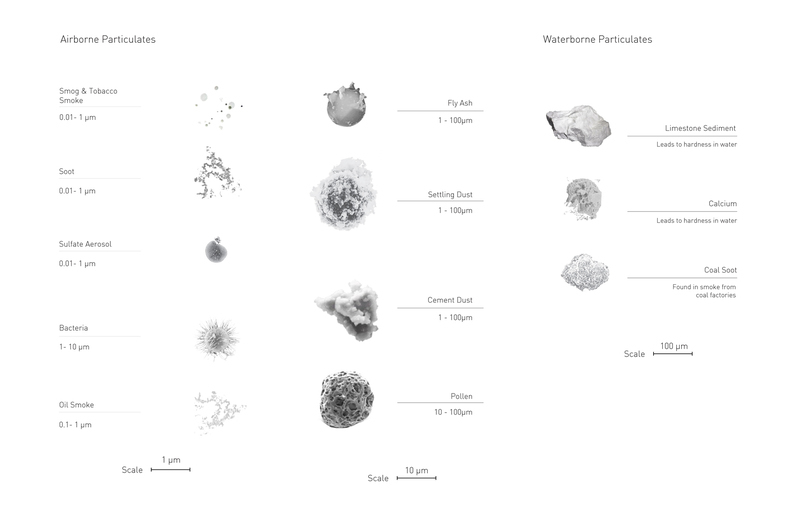 Through modes of indexing and accretion, the Particulate Forest partakes in an investigation of representing temporality and the force of pollution through cultural the physical degradation and ruination of materiality and space. 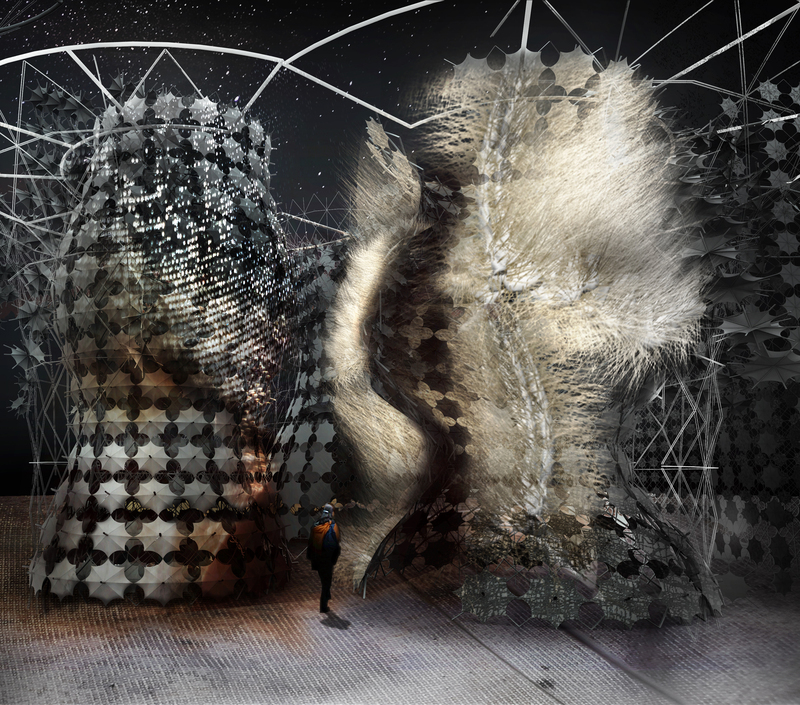 Particulate Forest attempts to reframe pollution and dust as an expression of contemporary situation mediated through the iconographic symbol of “the ruin”. 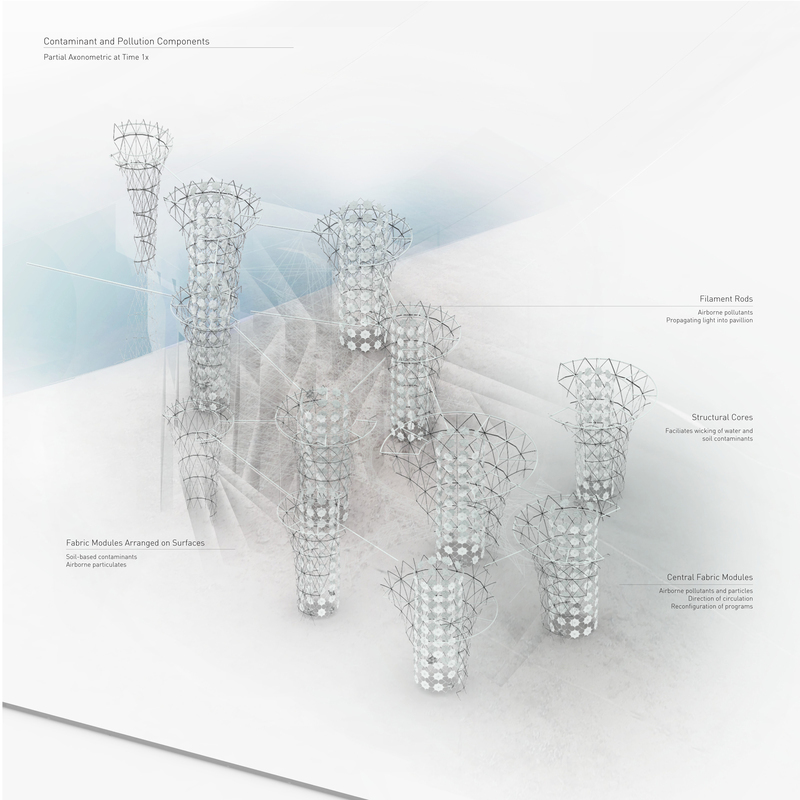 It is an investigation into the modes of material systems that register and index impalpable atmospheric conditions that is often wicked away or eliminated. 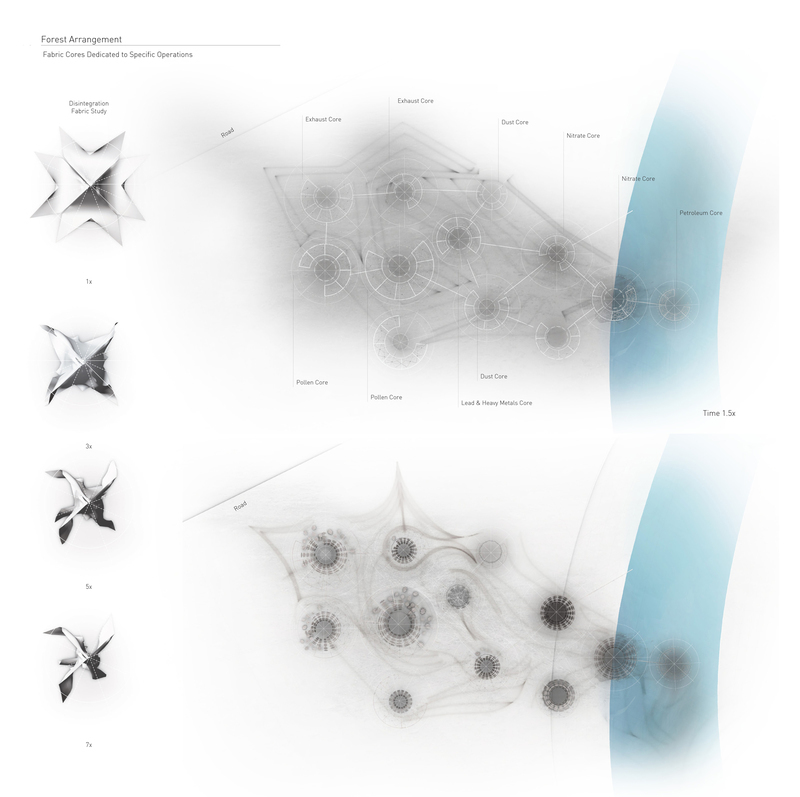 The project looks to translate such phenomenon to form spatial elements that propels the engagement of both human and nonhuman agents.